Smart knit helper for iPad. 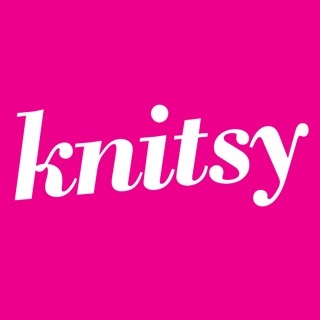 JKnit HD Lite is a free knitting pattern reader app for iPad. You can use this app to import and view patterns in both PDF and interactive JKnit formats. 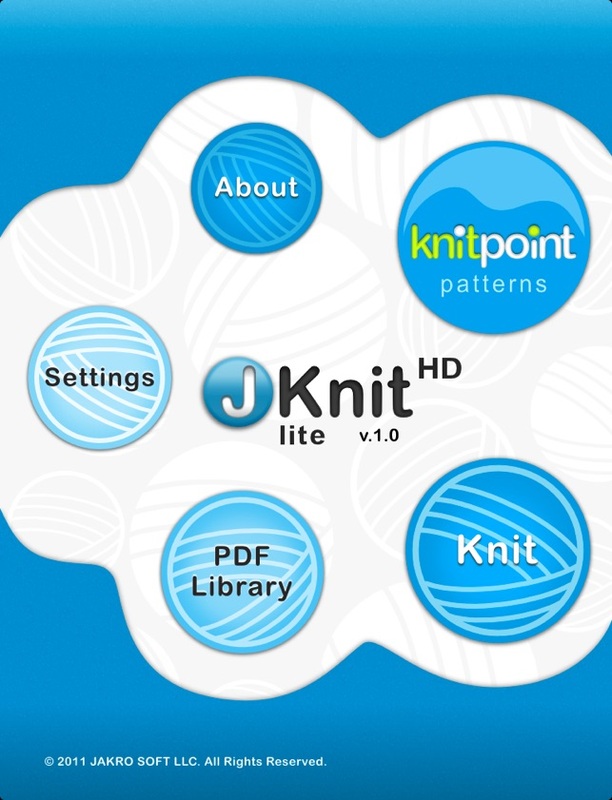 Try JKnit HD Lite for yourself and discover the best way of knitting! 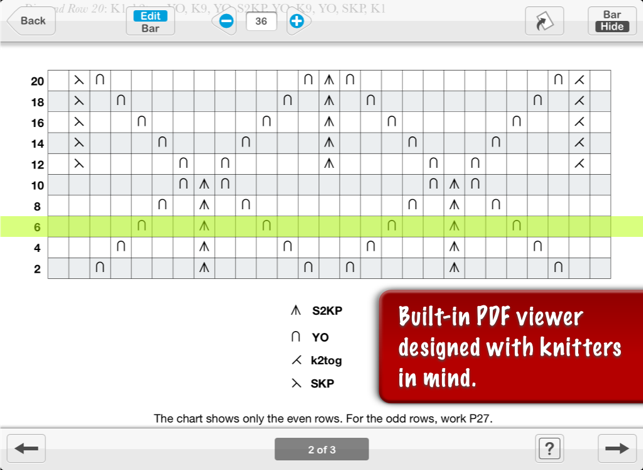 Built-in PDF viewer designed with knitters in mind. - Smooth PDF rendering engine with page zooming and scrolling. - Page rotation feature for landscape-oriented charts. - Follow charts with the help of the highlight bar feature with easily adjustable starting position and height. - Shift the highlight bar up or down using a simple double tap. - You can add a bar to each page of your PDF and JKnit HD Lite will remember all of their individual positions and settings. 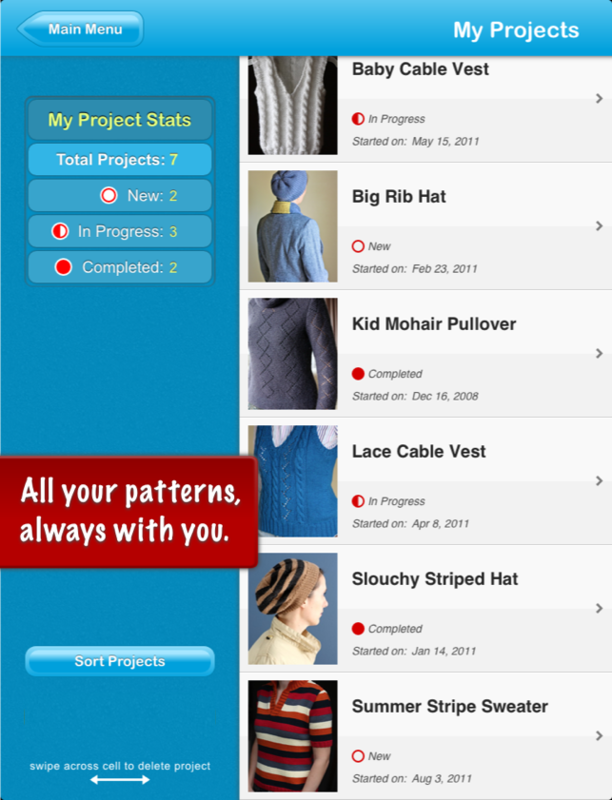 - You can import your PDFs into the app from your computer, e-mail attachments, websites or download them directly from your KnitPoint pattern library. Enjoy the benefits of the interactive JKnit pattern format. 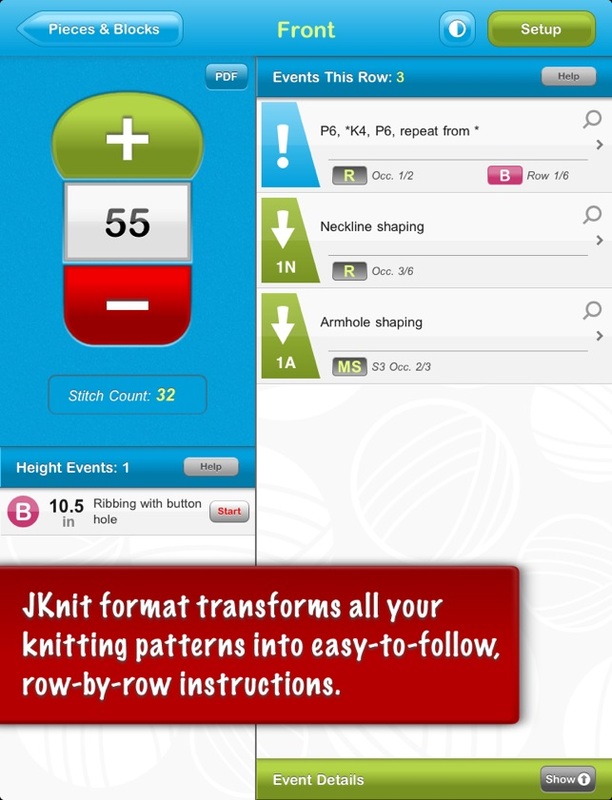 - JKnit format transforms all knitting patterns into easy to follow, row-by-row instructions. Just advance the counter as you complete each row, and the app will direct you what to do next. - The app will always remember your position in any project and will help you pick up exactly where you left off. - Keep track of all of the essential project information such as materials used, notes and the timeline and add your project photos. - You can import patterns in interactive JKnit format from your KnitPoint library. 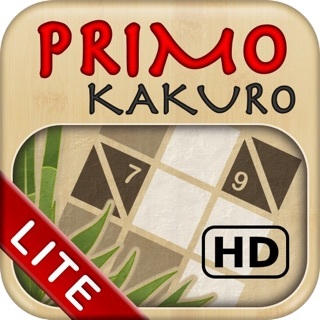 You can also get JKnit Lite - the iPhone/iPod touch version of this app! 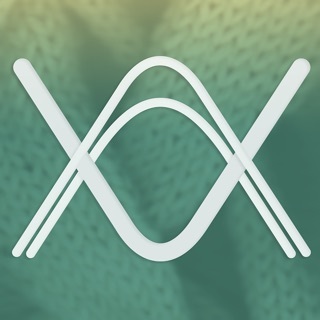 You can find it in the App Store by searching for JKnit Lite. JKnit HD Lite comes with a preloaded sample project to help you familiarize with the app and its features. 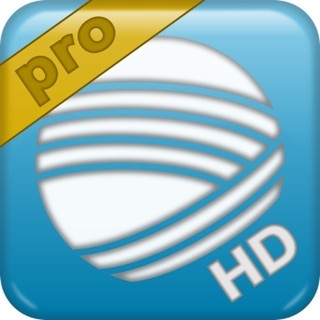 Fantastic app. I can take patterns along without taking loose papers or booklets. Two edits that I would like. One, I would like to be able to rename the files since often they download with a file number and not a name. Two, it would be nice to write notes in/on the patterns to remember changes that I needed or decided to make, kind of like an Adobe document. Otherwise, love being able to enlarge the charts and use a highlight bar to follow where I am at in the pattern. Until IOS 11, the app was great. Just need to remember to save a copy of everything you upload to the app because you cannot download your patterns once they’re in the app. If the app no longer works, you cannot gain access to your patterns. Now that the app is compatible with IOS 11 it no longer functions properly. At least on my 2017 ipad it doesn’t. The pdf pages will not frame themselves properly and often one page is split so you can only see half of it. Writing jknit is futile. Nobody replies. I once bought the pro version, but that didn’t work well either. Frustrating at best.